JACKSON, Michigan – The MCC women’s soccer team picked up a pair of impressive road victories over the weekend, taking down Parkland College 4-1 on Saturday before knocking off Jackson College 6-0 Sunday. Both contests were played at Jackson. The 12th-ranked Tribunes moved to 5-1-0 on the season. 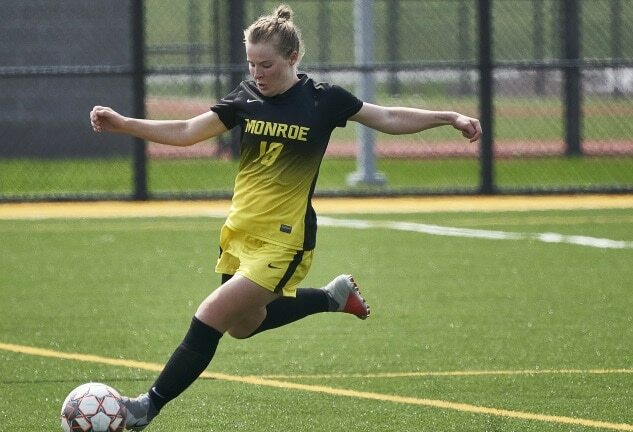 Roosa Ariyo and Justina Meneses had two goals apiece to power Monroe past the Cobras on Saturday. Each player tallied a score in the opening half before Parkland cut the lead to one midway through the second half. Ariyo restored a two-goal advantage with 11 minutes left, and Meneses added her second in the final minutes to put the game away. Thenia Zervas had two assists, while Ariyo and Katrina Yencer had one each. Meryl Wakefield made three saves to earn the win in goal. Ariyo got Monroe on the board early against Jackson on Sunday, and later added three more to cap a four-goal day. Yencer and Taylor Clark also found the back of the net, with Yencer assisting on two others. Grace Bushen, Paige McGrath, and Kimberly McPhearson all added assists. Wakefield made three saves in 78 minutes of work in goal for the Tribunes. Madison Mikula stopped one shot down the stretch to secure the shutout. MCC hosts a pair of big games this coming week. The Tribunes take on No. 9 Monroe College on Thursday, followed by a tilt with top-ranked Eastern Florida State College on Saturday.